← Discount for ERI CEUs. Happy Holidays to All! 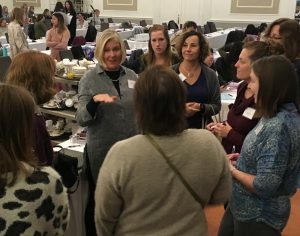 What happens when nearly 300 school-based therapists and specialists come together to exchange ideas, share resources, and address services and solutions? A community of professionals dedicated to making a positive and meaningful impact on the lives of thousands of children and families is born. 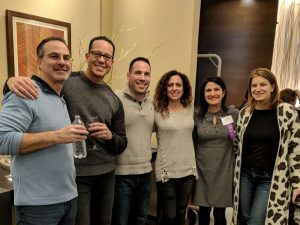 … and for the past 19 years, ERI has done just that; connect school-based therapists and faculty experts at the Annual Therapies in the Schools Conference. Our most recent conference took place November 2018 in Framingham, Massachusetts. 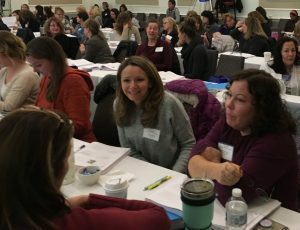 The two-day course and featured leading faculty members and speakers offering fresh perspectives on the ever-evolving field of school-based therapy. While we have offered our conference for 19 years, we are always energizing the crowd with new information and offerings. This year, attendees were invited to participate in Lunch Breakout Sessions including roundtable discussions to improve networking and share best practices, as well as informal Q&A sessions with faculty and speakers. 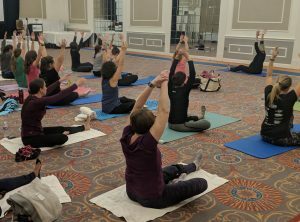 We made sure to have a little (well, maybe a lot) of fun at our Wine & Cheese Reception and started off Day Two with a morning yoga session led by faculty member Anne Buckley Reen. It was truly inspiring to see so many OTs, PTs, and SLPs travel from around the country and come together for two days of engaging conversation for the sole purpose of improving their practice and serving others. It was great to see familiar faces and meet new attendees as well. We can’t wait until next year! Did you attend this year’s Therapies in the Schools Conference? What did you like about the conference? What do you hope to see next year? Share in the comments below or join our Therapies in the Schools Discussion Group on Facebook! This entry was posted in Professional Development and tagged CEUs for School Therapists, school based occupational therapist, school based physical therapist, School Based Therapy, Therapies in the School. Bookmark the permalink.